Was video testing done full screen or letterboxed? Assuming it was done letterboxed, is it possible that backlighting of the display can be selectively turned off near the top and bottom of the screen? That would definitely save power. Not so sure the foundry part is working all that well,they didn't had 32nm for the ipad 3 and they had to cut a few corners without it (huge battery- ads cost , weight and bulk , way hotter , moving the ram on the other side of the PCB ). Sure there is. Apple has no control of the volume for the A5X if they have TSMC move to a new node and try and build a new SoC on it. We have seen ALL CPU/GPU manufacturers struggle with yield when transitions to new nodes coincide with new designs. So rather risk holding back 30 million iPad 3's to a April, May, June launch, they took the risk of low yields out of the equation and stuck with 45nm. Remember, any transition to a new node for any chip maker is typically a different Fab. And/or retooling existing Fabs. So as new 32nm Fab's come online, they won't be anywhere near the capacity of 45nm Fab's for some time. It's not just the iPad 3 that would find a 32nm shrink useful. 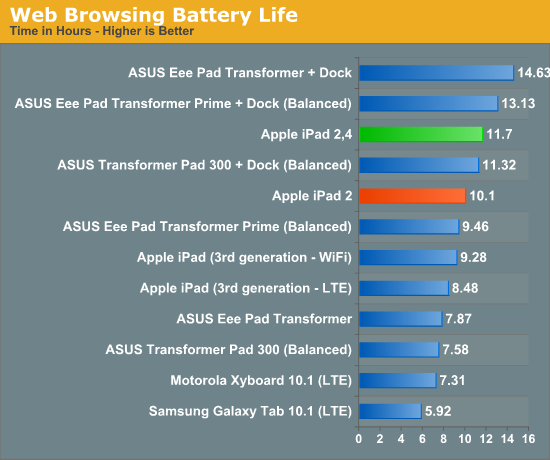 With it's higher battery consumption, it's interesting that Apple didn't decide to use the 3G iPad 2 as the 32nm A5 testbed. 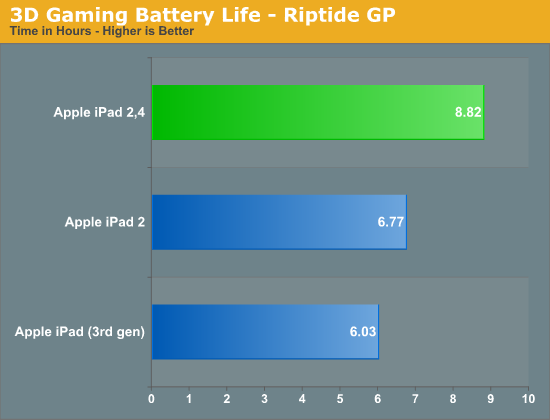 The 3G iPad 2 is also presumably a lower volume product than the WiFi iPad 2 which also works in it's favour as a pilot. Would an SoC change still require a new round of carrier/government radiation testing, since that would be a major disincentive? 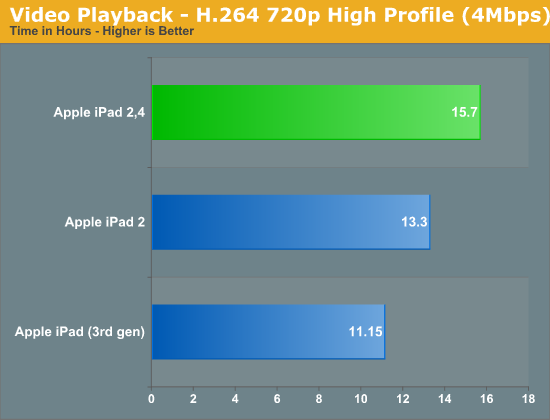 It's good that you found the performance of the iPad2,4 unchanged. Your previous new AppleTV articles mentioned that it was coupled with a single 512MB LPDDR2 RAM die indicating only a single 32-bit channel memory configuration. 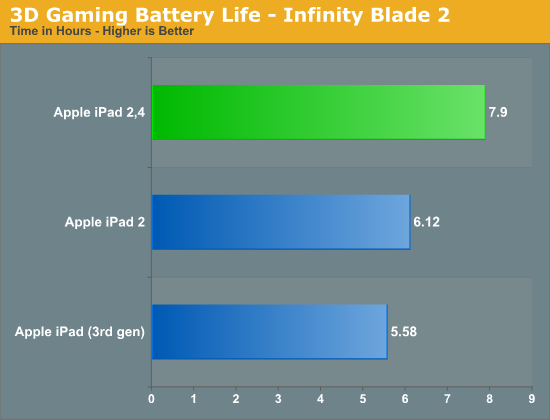 It looks like the 32nm A5 in the iPad 2,4 implements the full 2x64-bit memory system. Everything in iOS is synced to 60Hz, which SGX543MP2 already does at 960 x 640. Apple is selling every single iPad that they make. Potential supply constraints from a new process is a huge risk to take. Low initial yields are a common bottleneck for new products, look at what is happening with the GTX 680 right now. They weighed the pros and cons and decided to go with what is proven, tradeoff being the absolutely massive A5X SoC.